This article first appeared in the December 2007 issue of The eChatter, the email newsletter of Emerald Necklace M.G. Register, Inc., a northern Ohio MG registry. Used with permission. Why would anyone want to install air conditioning in an MGB? In fact A/C was a dealer installed option on some later year MG's but it was large, heavy and power robbing. Riding with the top down on a nice summer evening or warm day is a real joy. There is nothing like it. On the other hand, taking a long trip to a national NAMGBR show in late June or early July can be somewhat of an ordeal. You start out in the cool of the morning with the top down but then about noon with the sun high overhead and the temperature approaching 90 it gets very uncomfortable. A few hours of this and an old geezer like me can get quite irritable and testy which starts to take a lot of fun out of the trip especially when the navigator is feeling the same way. When I read that Moss had developed an A/C kit for the MGB that you could install at home I started to seriously think about getting it. I finally made up my mind and ordered the kit early in October. 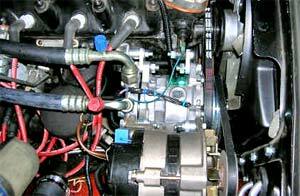 The rest of this article deals with the installation of the Moss A/C kit in my 1972 MGB roadster. The sales literature states that the installation should take around 10 hours. NOT!!! I consider myself a fairly good backyard mechanic. I am doing a frame up restoration a 1957 MGA by myself. I also did a rolling restoration on my 1972 MGB so I am reasonably competent at this mechanical stuff. The installation actually took me around 25 hours over 5 days. Not a big deal but not even close to 10 hours either. Having this done at a shop could be quite costly. Any competent back-yard mechanic should be able to do this installation. Just give yourself enough time. The instructions are without a doubt the best, the most complete, the most detailed and the most comprehensive set of instructions that I have ever seen. If the Iranians had instructions this good on how to build an atomic bomb they would have one by now. There are 78 detailed steps, each one with multiple color photos. I just can't say enough good things about it. Whoever wrote these up deserves a bonus for superior work. The first page of the instructions lists all the tools you will need. I had all the tools except for a 1-1/2" metal hole saw and who has one of those, however there are other ways to cut a 1-1/2" hole in a piece of metal. Needed are a number of common size wrenches and sockets both SAE and metric. The rest of the required tools are quite common and can be found in any decent tool box. There is nothing more annoying to me than getting all set to do a job and finding out that I don't have all the parts. On the first instruction page it states "We recommend having all the factory seals and a FAN SHROUD" and "we recommend you install a COOLANT OVERFLOW BOTTLE if your car is not already equipped". Then in Step 4 "You will need to replace your oil cooler hoses with TWO 39" STAINLESS STEEL HOSES". So I had to put off the installation until I could get those parts. Jeff Zorn at LBCarCO was very helpful in getting those parts for me within a week. Later on in the installation — Step 59 Installing the alternator — I ran into another parts issue. I put the alternator back on the car and slipped on the belt. Even with the adjuster fully extended the belt was loose. The problem was that there are two sizes of pulleys for MGB alternators — 2-1/2" and 3". I had the smaller pulley. I was able to dig through my spare parts bins (we all have them) and find a larger pulley which fixed the problem. The last thing you do in the installation is install a drainage line for the evaporator in the rear right hand corner of the passenger compartment. For this you have to drill a 25/64" hole in the floorboard. By this time you have already installed the evaporator and there is no room for a standard drill. Fortunately I have an angle drill and was able to drill the hole. The bottom line is that the hole should be drilled before the evaporator is installed. Other than that I had no parts or installation issues. The kit is very complete and there were no missing pieces. It would be helpful if someone from Moss called when they got the A/C order and advised you of the suggested parts. After all this kit does retail for a hefty $1800. Note: The air pump had been removed from my car previously so I did not have to follow any steps involving the air pump. If your car has an air pump it would add some additional time to the installation process. The first installation instruction says to jack up the car and put it on jack stands. The only time you need to get under the car is to attach the main power wire to the hot side of the starter. I am just a short fellow so having the car on jack stands makes it difficult for me to work under the bonnet. I did not jack up the car and put it on jack stands until I made the electrical connection to the starter. The first few steps consist of taking things apart. Disconnect the battery and oil cooler lines. Remove the washer bottle bracket, the radiator support brackets, radiator supports and radiator. Remove the air pump if there is one. You will also have to remove the Charcoal Canister and blanking plate. Two 1-1/2" holes need to be cut in the blanking plate to accommodate the A/C lines to and from the Evaporator which is mounted inside the car. I used the old drill small holes and file technique. Now we start to put things in. Install supplied brackets on the compressor. Install the compressor and belt. Modify the fan shroud for compressor clearance. Install fan switch on the radiator. Mount coolant overflow bottle on radiator support. 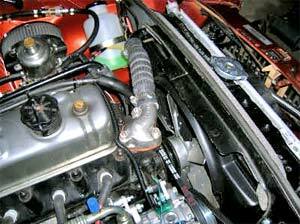 Install fan shroud, radiator support, support brackets and radiator. Mount cooling fan on condenser and install condenser mounting brackets and condenser. Install oil cooler lines. Run A/C lines from compressor to condenser. Install evaporator unit under dash on passenger side. Reinstall the blanking plate and charcoal canister. Run A/C lines from evaporator to compressor and condenser. 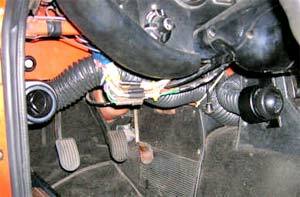 Install wiring harness. Install alternator. Install air pump if you have one. Mount washer bottle bracket. Mount A/C control switch on console. Install the four A/C vents. Install drainage line. Please note that each one of these operations has multiple steps. It was another nice but cool day the last Sunday of October. We headed from Lakewood to our son's home in Wellington (about 40 miles) so he could charge the system. He has the required equipment to do this; all I had to do was supply the R134a. Stopped at Advance Auto Parts and bought three 12 ounce cans at $6 per can. Once there we completed the installation by mounting the A/C cutoff switch and hooking up the lines to the dryer. This took about 5minutes. Next step was to evacuate the system by hooking up a vacuum pump and then charging the system with the three cans of R134a. When that was finished we checked the pressure to make sure the system was sufficiently charged but not overcharged. The A/C has three levels of control from the single three position switch mounted on the radio console. It sure does blow cold air — lots of it especially on the high setting. Of course we could not leave it on for any length of time since the temperature outside was only 60 degrees. I had set the idle to around 1200 RPM as per the instructions. With the A/C turned on the idle dropped by about 200 RPM so I can probably set the idle down a bit. We did turn the A/C on briefly on the way home and even with the overdrive engaged I could not perceive any significant drop in performance. However to be honest, the engine in my 1972 MGB is not strictly stock. When we rebuilt it about 6000 miles ago we put in 0. 040 oversize high compression pistons, a street cam, unleaded ported head and a Pertronix ignition. As I mentioned previously the air pump had also been removed. The real test will come next summer when we give it a workout on a hot day. I'll do a follow-up evaluation then. One of the things that Moss suggests if you are going to install their A/C kit is to install a Fan Shroud. I ordered a Shroud from LBCarCO along with a radiator overflow bottle neither of which my 1972 MGB had. The Moss catalog states that the Fan Shroud (459-685) is for MGB's 1962-1967 so I figured that I had some trimming to do in order to get it to fit. It turned out that no trimming was required. The holes matched right up. What was required was some steady downward pressure to get it past the downward facing blades of the 6 bladed fan. This was not a problem since the heavy duty plastic that the Shroud is made of was flexible enough to properly seat. 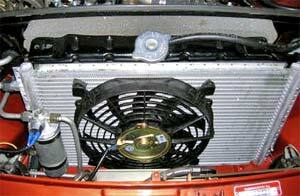 Since the same radiator and 6 blade metal fan was used on MGB's from 1968-1975 I have to conclude that the Fan Shroud can be retrofit to those model years. 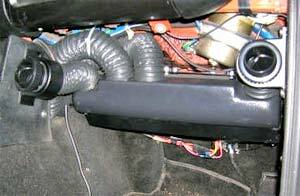 The 1962-1967 MGB's had a 3 blade metal fan that would not interfere at all with the Shroud installation. As regards to model years 1976-1980, that's another story for another time.